Is it OK to become friends with a patient on Facebook? With the expanding use of social media, this is a question that often pops in a practitioner’s mind. 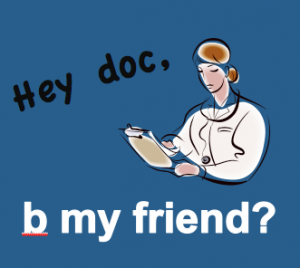 Often, doctors receive friend requests from their patients on facebook ( as well as other social media) or a name of a patient crops up in the suggestion box prompting a practitioner to send a request. “Should i do this?“, is a question that comes to mind then, with the answer and the actions thereof depending on the doctor’s viewpoint and her/his circumstances. A few days back, the Singapore Medical Council, updated its guidelines for medical practitioners, and probably as a first addressed the issue of Social media and internet presence of medical practitioners. The guidelines calls for doctors not initiating a relationship on social media with their patients, and if initiated by the patient, take all measures to protect the dignity of the doctor-patient relationship including maintaining their confidentiality at all times. While indeed, they are not mandatory for doctors practicing outside Singapore, however, in the absence of Indian guidelines for the same, they do make an important point for discussion and future reference. Here are the important excepts from the guideline adressing the issue. You ought not to breach professional boundaries by initiating social media relationships with patients. Engaging in social relationships with your patients through the use of social media platforms can blur the professional boundary between you and your patients. Although superficial and casual interaction on social networking sites may appear innocuous, you should be aware that that the power imbalance between you and your patients may influence your patients’ decision to enter into online relationships with you. You are not to initiate social media relationships with your patients because patients may be put in a position where they feel pressurized or obliged to engage you. If you accept social media relationships with your patients who initiate them, you need to take care not to compromise your patient-doctor relationship by sharing anything that would breach patient confidentiality or privacy, or through inappropriate words or behaviour towards patients. Whereas it is inappropriate for you to invite patients to be friends with you on social media, if patients of their own accord initiate social media contact, you may engage although it is strongly recommended that you do not do so. If you do enter into personal social media relationships with patients who invite you, perhaps in order not to give offence, or simply out of politeness, you have to prevent any compromise to your professional relationships by the inappropriate sharing of personal information which might breach patient confidentiality or privacy. You ought not to discuss patients’ confidential medical matters online as others may have access to the information. Social media is not an appropriate medium for medical consultations or for patients to discuss with you any medical matter. In any case, your behaviour should be of the highest standard as the relationship of respect and trust could be seriously damaged through inappropriate words or behaviour towards the patients. If you are active in social media or develop a strong internet presence, you need to be careful that any exposure of your personal life and actions does not diminish your professional standing or the trust and confidence that patients have in you, or bring the profession as a whole into disrepute. Appearing intoxicated by alcohol or drugs. Engaging in lewd or inappropriate behaviour. Breaking rules or the law. Speaking or writing in an indiscreet, bigoted, rude, obscene or profane manner. Posting personal or derogatory comments about patients or colleagues. Don\’t mix profession with Friendship. It is not only the misuse, I even consider it as a mischief.